Our friend Sandi at OffHand Gear has done it again. She’s created a thoughtful, unique, quality shooting product. The new NORM (No Ordinary Range Mat) is not like the range mats you have seen around. 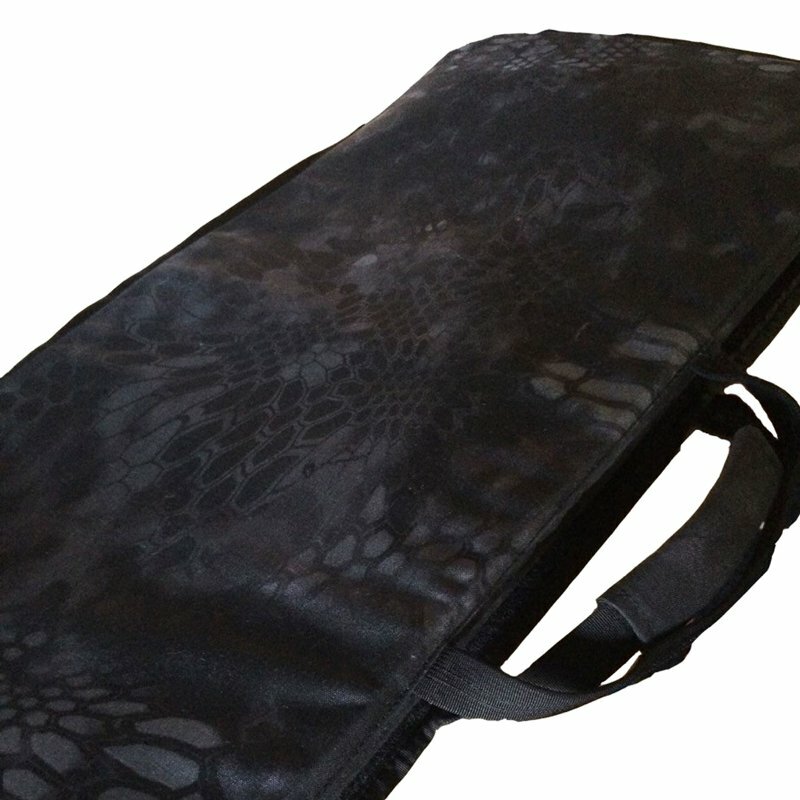 Her long-range precision shooting mat has a fan-fold style closing (no more edges curling up on you), is long, wide and completely padded (who wants to feel all those branches and rocks), a bi-pod stop which also doubles as a carry handle or use the ambidextrous sling for easy carrying. NORM is light and features a velcro style loop fabric surface on the top 2 panels (30″). Why, the loop fabric? One, it is softer than traditional canvas type materials making it more comfortable. Coming soon is also a line of accessories that will have the hook side sewn onto them that make you able to attach them to the mat, keeping your accessories in place. The OffHand Gear range mat is one that changes how you look at a range mat, it makes sense, works and is built in America ready to handle the abuse of constant range time. What’s the story behind your new shooting mat? Sandi: In Feb of 2016 I was invited to go out to the range with a group of pro long range shooters. I hadn’t shot long range before but was defiantly interested in it. Once everything was set up the line was amazing! A dozen or so beautiful rifles set up all in a row, all different calibers and styles. Each with it’s own mat and set up ready to go down the line and try them. I noticed right away that many of the mats were curling up on the end, some people were part way off of and thought “wow, these guys have the newest, best equipment but those mats, what’s up with that?” Long story short, I fell in love with long range shooting, got myself a newbie rifle and started to acquire gear. Didn’t need a lot but a mat of course was gong to rank up there with a case for my rifle. I just couldn’t find a mat that had the features I was looking for. Why wasn’t someone making a “different” mat? Why is everyone making the same basic mat? So as I have done before, I hit the drawing board. I made a list of what I did or didn’t want and started building my own, and now I think I have a great addition to the OffHand Gear brand of products. What makes NORM different from other mats? Sandi: At first NORM may not look very different, but I believe it has a quite a bit more features then anything else out there. For starters, It’s a nice size 75” long and 44” wide at widest point (32” at smallest). NORM has padding that might not look like much but it is a dense, light weight pad and gives your knees cushion as you set down and keeps those pesky rocks and branches from being so pokey, the padding runs the full length of the mat and the wings, if your elbows are going to be there, that’s an important spot to have some padding in my opinion. One of the more unique features in NORM is the loop side of “hook & loop” fabric, it covers the top 30” of the mat. This fabric serves 2 purposes. One, to be a softer fabric for elbows to rest on and also to hold accessories like a spent brass bag, data book or rear bag in place. Yes, these accessories will also be available as part of the series. Another very unique feature to NORM is the handle. While it serves as a means to carry its first purpose in the design is as a bi-pod stop. You put your bi-pod legs in there and while you are pushing forward your rifle stays put instead of sliding in the rocks, sand or grass. For carrying, there is also an adjustable sling style strap that is ambidextrous, you can move the sling to fit in either corner and carry it left or right shoulder, Oh, the curl, I can’t leave out one of the biggest peeves I have with shooting mats, that curl at the end that happens from rolling the mat up. NORM folds up in a fan-fold manner, this of course means there is no curl, but also makes it really easy to store right next to your rifle case. Myself, the bi-pod stop handle works perfect around the handle of my hard case and it’s more like carrying one item instead of two. I honestly feel I designed one of the best USA made, long range mats on the market and once you try OffHand Gear you won’t want anything else! To order yours or find out more, check out the NORM in our AG & AG store.